Eventually, the company plans to 3D print a rocket on Mars. A three-year-old startup is trying to launch rockets into space that are almost entirely 3D printed. And it just got permission from the U.S. Air Force to launch from the historic Launch Complex 16 at Cape Canaveral in Florida. Relativity Space — a rocket-building company founded by SpaceX and Blue Origin alumni — revealed a new contract with the U.S. Air Force this week that would allow it to launch from a site that has been unused since 1988, according to Quartz. If the company manages to regularly launch rockets from the site, it could be able to extend the contract into a 20-year exclusive agreement with the Air Force. Relativity Space has ambitious plans: it wants to 3D print an entire rocket with its groundbreaking, building-sized Stargate metal 3D printer, then launch it into orbit. Its long term plans are also enormous — the company wants to eventually 3D print rockets on Mars, according to its official website. 3D printing a rocket would be simpler and allow for more efficient designs, fewer moving parts, and faster construction. The company’s first planned launch vehicle called Terran 1 would only take 60 days to print, and would have a max payload of 1,250 kg (2756 lbs) to low-Earth orbit — at least if everything works out as planned. Relativity Space is going through a growth spurt right now. Its number of employees rose from 14 to 60, co-founder Tim Ellis told Ars Technica. 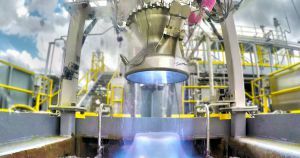 It’s also planning a test launch of the Terran 1 rocket in 2020, with commercial missions starting in 2021. Using 3D printing technology to blast off into space is an exciting idea, and could make building rockets faster and cheaper. But the proof is in the pudding — or rocket fuel.